Manual packing and shipping stations are very important and critical for the fulfillment process in distribution and warehouse centers. 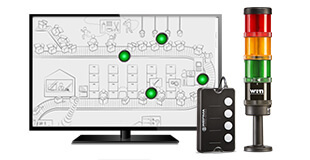 The AndonSPEED system takes an existing stack light and turns it into a wireless Call-for-Action System. Status changes such as missing material and support requests are transmitted wirelessly from the manual station to a central location and can also be sent via E-Mail to the response team. Upgrade your existing stack lights to a wireless monitoring system for machines and manual workstations. The simple retrofit solution helps you to make processes faster, leaner, better and more efficient. Shorten your response time and optimize your manufacturing process with the MDC alternative to never miss a critical situation. 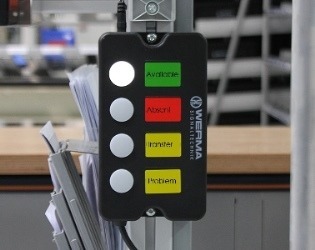 Whether stack lights are used on machinery and equipment, manual workstations or for access control and point-of-sale systems, WERMA stack lights reliably signal different statuses, such as faults or material replenishment requests. The urgency of the signal can be easily increased using different signal elements which enable an immediate response and resolve any problems quickly. BeaconsVisualization of any risk and imminent danger situations to react promptly and confidently. 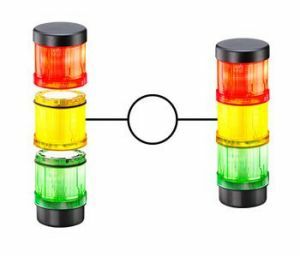 Traffic LightsCombined signaling lights for garages, access control, loading docks or even to regulate traffic on site. Audible Signals Loud solutions to warn and protect where caution is required and to indicate any emergencies. … today, WERMA signals secure all processes! 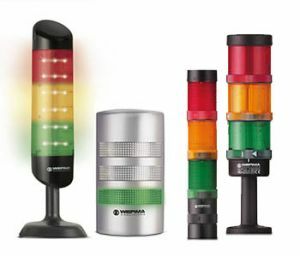 WERMA signal technology is one of the worldwide leading companies producing visual and acoustic signalling devices. Our solutions make working environments safe and processes more efficient – whether used on machines or manual workstations, in factory halls or entire buildings. From signal towers and signal lamps to horns and sirens - our signalling devices warn, guide and protect people around the globe. Our unique signal towers can be easily turned into machine data acquisition systems. This is what we call intelligent signal technology.